Do You Have a Question About Crochet? Maybe You'll Find the Answer Here! I spend many hours each week answering our visitors' questions about crochet. This page is a resource you can use for locating the answers to questions that have already been answered; the answers are all posted somewhere on our website, and they are linked below so you can hopefully find them easily. How do I get started with crochet? Answer: We'll help you! Check out this page: How to crochet. See also: free crochet videos. I'm left handed. How do I crochet with my left hand? How do I crochet the chain stitch? Answer: Check out this chain stitch tutorial for step-by-step instructions. How do I crochet the slip stitch? Answer: See our slip stitch instructions. How do I do the single crochet stitch? Answer: Our single crochet tutorial shows you how. How do I do the half double crochet stitch? Answer: Check out our half double crochet tutorial to learn this stitch. How do I do the double crochet stitch? Answer: Take a look at our double crochet tutorial to learn how. How do I do the treble crochet stitch? Answer: Check out this page on how to do treble crochet. Answer: This tutorial shows you how to change colors in single crochet stitch. You can use the same steps to change colors in any other basic crochet stitch. How do I crochet two colors in the same row? Answer: Tapestry crochet is one technique you can use for doing this. See our tapestry crochet tutorial for more info and step-by-step instructions. How do I crochet a blanket? How do I crochet a granny square? Answer: Check out this granny square tutorial to learn how to crochet a basic granny square. How do I crochet a dishcloth (or washcloth)? How do I crochet a shawl? Answer: Check out this easy shawl tutorial for one possible way of doing it. How do I crochet a baby hat? How do I put blocks or squares together? Answer: Check out these methods for joining granny squares and other crocheted pieces. How do I attach an applique to my craft project? Answer: See how to attach appliques. Is it possible to knit with a crochet hook? 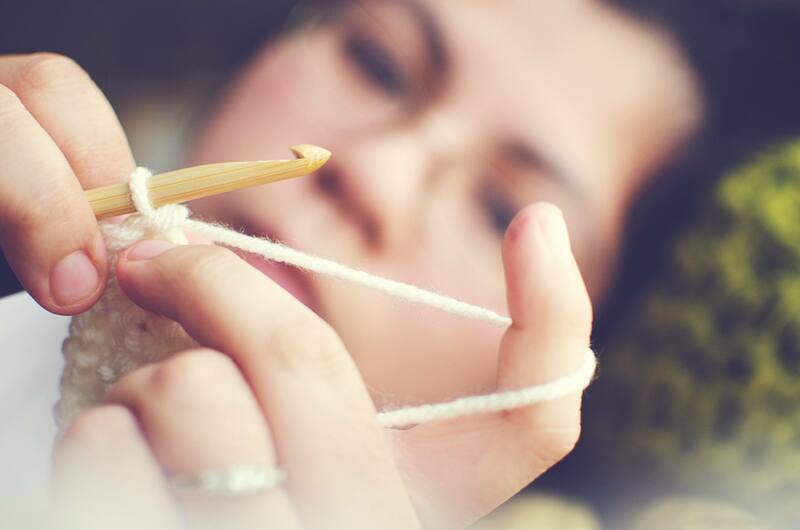 Answer: See How to knit with a crochet hook. How do I prevent blisters when crocheting? Answer: ​Learn about blister prevention. Answer: Here's a summary of the main differences. Read an overview of freeform crochet. What is a tapestry needle, and why do you need one for crocheting? What is "Knooking"? What is a "Knook"? What is a chemo cap? Answer: The definition of a chemo cap. Answer: Learn the meaning of the phrase "coned yarn." What is the correct hook size for crocheting a rag rug? Do You Have a Free Crochet Pattern For...? Do you have any free patterns for afghans? Answer: Of course we do! Check out these free crochet afghan patterns. How about baby blankets and baby afghans? Answer: Please take a look at our free crochet baby blanket patterns. Do you have any free granny square patterns? Answer: This page features free granny square patterns. You can also find another page of free granny square project ideas. Where can I get free hat patterns? Answer: Right here on our website! See our free hat patterns. Where can I get free scarf patterns? Answer: See our free crochet scarf patterns. Where can I find free dishcloth patterns? Answer: We've posted a whole bunch of free dishcloth patterns for you to use. Where can I get free washcloth patterns? Answer: Take a look at a variety of free washcloth patterns. I'm looking for a head wrap pattern. Do you have one? Answer: Yes! Try one of these suggestions. Where can I find crochet patterns for baby shoes? Answer: ​Here are some patterns to try. Do you have any free crochet patterns for milk jug covers? Answer: We don't have any posted on our website, but I made a list of links to milk jug cover patterns that you can find on other websites. Do you have any flower patterns suitable for boys? Answer: Click here to see my suggestions. I have scrap yarn that I want to make something small with...do you have free patterns for this? Answer: I've compiled a list of free scrap yarn patterns; additionally, Andrea Lyn Van Benschoten has contributed a list of ideas for using leftover yarn. I hope these resources will be of interest! I have a crochet chart. How do I read it? What does each square on the chart represent? Answer: See this page: How to read a crochet chart. What crochet books do you recommend? Answer: Check this page of crochet books to see a list of the books we've reviewed on our website. Can I buy these books from you? Answer: No, sorry, we don't sell any books. We make all our resources available for free! (See also: free crochet stuff.) However, when we write reviews, we do our best to link you up to places where you can buy the books. I'm a total beginner. I don't know anything about crochet. What yarn should I buy? Answer: See these yarn recommendations for beginners. What yarn should I use for crocheting potholders? Answer: Here are my suggestions. What does "worsted weight yarn" mean? Answer: Learn the glossary definition of worsted weight yarn." What is a crochet needle? Where can I buy a Tunisian crochet hook? Sometimes your crochet projects just don't turn out like you expect. When that happens, naturally, you want to know what went wrong. If you are having a hard time figuring out how to fix the problem(s), there are several things you can do. I am crocheting from a graph, and my stitches look jagged and awful. Is there a fix for this? Answer: Learn how to deal with this problem. Please help! My yarn is from two different dye lots. What do I do? Answer: There's an easy fix for this. Is crochet the right hobby for me? How will I know if it is or isn't? Answer: why not jump in, give it a try, and then trust your instincts from there? I've written an article with additional insights that you might find helpful. See this page: Is crochet the right craft for you?